Nowadays, you can buy almost anything with just the click of a button. Whether it’s a car, clothes, or electronics, you can buy it online. Now, there’s another vertical gaining traction with online consumers, and it might not be what you expect. Companies like Instacart and Shipt are providing online grocery shopping and delivery services to the Midlands. Each company’s platform is slightly different, but the main concept is that consumers are able to download an app or go online to compile a virtual shopping cart with items from stores like Publix, Whole Foods, and even Petco. An expert shopper will collect the items from the stores and deliver them to the consumer on the same day. Companies like Amazon have made fast delivery an online-shopping standard, but the grocery industry has only just begun to pick up speed in the last few years. Nick Friedrich, manager for San Francisco-based Instacart, founded in 2012, says that with growing consumer expectations, it was only a matter of time before the grocery industry was forced to change. 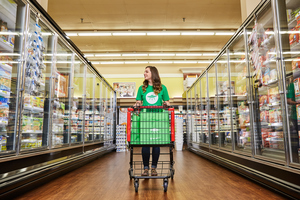 Instacart, which offers delivery to Columbia, Forest Acres, West Columbia, Lexington, Irmo, Chapin, Elgin and Blythewood, has about 350 employees nationwide and several thousand part-time employees. Friedrich says that in Columbia, they’ve hired 100 shoppers and plan to continue to grow that shopper community as demand and need picks up. Friedrich says that while Instacart is still in its very early days, it and companies like it are on the cusp of helping to shift consumer behavior and trust. Trust is important because it’s one of the largest hurdles to gaining users. 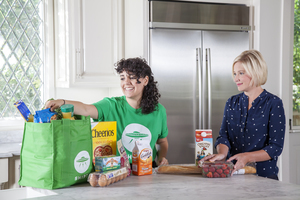 Julie Coop, outreach and events team lead of Shipt, says that the biggest barrier to converting a new user to online grocery shopping is proving to them that they can trust the judgment of the well-trained and hired shoppers. Shipt, which is even newer than Instacart, was founded in 2014 in Birmingham, Ala. It’s since grown to service 51 cities nationwide, with 250 headquarter employees and tens of thousands of shoppers across the nation. “It’s getting people to try it once, and once they do, they’re like, ‘Wow, this is magical,’ ” Friedrich said. These services appeal to several demographics as well. There’s the Millennial, who is excited and enticed by new, efficient services; the busy parent, who can use the few hours a week they previously spent at the grocery store instead at home with their kids or at the gym; and then there’s the homebound or disabled, who cannot leave their homes and benefit from a delivery service. Even though it might seem like delivery services for other verticals popped up overnight, there are a lot of factors that need to be taken into account when beginning to offer delivery services. One main obstacle unique to the grocery industry is that it deals heavily with perishable items that need to be handled carefully and quickly. While a clothing retailer can store products in a warehouse indefinitely, grocery providers don’t have that luxury. Coop likens Shipt to a personal shopping service more than anything else. The personalized nature of every exchange is what sets this platform apart from other stores that offer curbside grocery pick-up. Coop, who both uses and shops for Shipt, says that there have been times when she’s left off something crucial from her shopping list, but because her shopper updates her through the process, nothing was forgotten. Coop said that it might seem like a small advantage but it’s all in the name of simplifying lives. Lorrie Griffith, editor in chief of The Shelby Report, a grocery industry publication, says that this move towards online commerce is just another change in an ever-changing industry. And now, in the wake of the $14 billion Amazon/Whole Foods deal, Griffith says it’s been a wake up call to the industry. Both Instacart and Shipt partner with Whole Foods, but Friedrich and Coop say that the deal probably won’t be having an immediate impact for a long time. “Really the big news around the story is that the space is going to change, and Amazon just made a $14 billion bet that it will change, and that is very exciting,” said Friedrich.